6 University of Toronto, Departments of Medical Biophysics and Molecular & Medical Genetics, Toronto, Ontario, M5S 1A1, Canada. Glycogen synthase kinase 3 (GSK-3) is an important molecular player involved into diverse cellular functions including metabolism, transcription, cell survival and synaptic plasticity. Here, we focused on characterization of the cognitive effects of GSK-3 inhibitor, a newly developed compound VP3.36. In particular, we assessed VP3.36 effects on working memory, episodic memory, executive functioning, spatial learning & memory and fear memory. VP3.36 (3 mg/kg) significantly enhanced working memory and spatial object recognition in C57BL/6J mice. The GSK-3 inhibitor was able to speed up solving obstacles given to experimental animals in the Puzzle test, thereby improving their executive functions. Lastly, VP3.36-treated mice learnt faster to find the escape platform in the Morris’ water maze and exhibited better spatial long-term memory than vehicle-treated animals. At the same time, GSK-3 inhibition did not affect fear memories, sensorimotor gating, emotional behavior or ambulation, suggesting that GSK-3 inhibition underlies specific cognitive processes, which are likely coupled with certain mechanisms of synaptic plasticity. Given that GSK-3 inhibition has clear effect on long-term depression (LTD), and the functional role of LTD in brain is still far from complete understanding, next, we probed effects of VP3.36 on synaptic LTD in the hippocampal CA1 subregion. We found that incubation of hippocampal slices with VP3.36 sufficiently prevented synaptic LTD, further supporting implication of GSK-3 into mechanisms of synaptic plasticity. Taken together, VP3.36 facilitated working memory, spatial episodic and long-term memory, enhanced executive functions in parallel with its ability to prevent synaptic LTD. Overall, our experiments showed implication of GSK-3 into mechanisms of synaptic plasticity and certain cognitive functions which help to deeper understand fundamental molecular-cellular mechanisms of cognitive enhancement’s processes. Glycogen synthase kinase-3 (GSK-3α\β) is constitutively active, ubiquitous serine/threonin kinase abundant in the central nervous system (Woodgett, 1990). The enzyme was first isolated as molecule which phosphorylates and inhibits glycogen synthase (Woodgett, 1990). There are two isoforms of GSK-3, α and β, which are different by their N- and C-terminal regions and highly homologous within kinase domains (Woodgett, 1990). The activity of GSK-3 is most commonly regulated by phosphorylation on regulatory serine, serine-21 in GSK-3α and serine-9 in GSK-3β. Phosphorylation of GSK-3 at N-terminal regulatory serines decreases GSK-3 activity. Such phosphorylation can be conducted by several kinases, including Akt (Cross et al., 1995), protein kinase C (Goode et al., 1992) or protein kinase A (Fang et al., 2000). This modification of GSK-3 inhibits its capacity to phosphorylate its primed substrates (Cross et al., 1995; Kockeritz et al., 2006) and is targeted by neurotransmitters and psychotropic drugs (Li and Jope, 2010). Besides N-terminal serine phosphorylation, GSK-3 also can be phosphorylated by p38 protein kinase on the C-terminal serine-389, which also decreases enzymatic activity (Thornton et al., 2008). In opposite to serines phosphorylation, GSK-3 activity is increased by phosphorylation on tyrosine-279 of GSK-3α and tyrosine-216 of GSK-3β, which facilitates access for substrate binding to GSK-3 (Hughes et al., 1993). Active GSK-3 phosphorylates serine or threonine residue on its target substrate (Dajani et al., 2001) and usually inhibits the activity of their downstream target (Woodgett, 1994). GSK-3 phosphorylates a broad range of substrates including β-catenin (Rubinfeld et al, 1996), the immediate early gene c-Jun (Boyle et al., 1991), IRS-1 (Eldar-Finkelman and Krebs, 1997), the cytoskeletal protein tau (Hong et al., 1997) and glycogen synthase (Beurel and Jope, 2006). Several factors regulate GSK-3 activity, such as intracellular calcium (Hartigan and Johnson, 1999), tyrosine kinase ZAK1 (Kim et al., 1999) or Fyn (Lesort et al., 1999). GSK-3 is inhibited by PI3K-Akt through serine phosphorylation (Ueki et al., 1998), Wnt signaling (Siegfried et al., 1992) or DISC1 (Mao et al., 2009). GSK-3 is central within several intracellular pathways including Wnt\β-catenin, Sonic Hedgehog, Notch, growth factor, and G protein-coupled receptor signals, which are related to glucose regulation, apoptosis, intracellular signaling, neuronal inflammation, and multiple aspects of neurodevelopment (neural progenitor self-renewal, neurogenesis, neuronal migration, neural differentiation, and synaptic development (Kim and Snider, 2011). Therefore, abnormal GSK-3 function is thought to contribute to pathogenesis of inflammatory diseases, diabetes, some types of cancers, but also to several mental disorders including neurodegenerative diseases - Alzheimer’ disorder (Jope et al., 2007), Parkinson’ disorder (Golpich et al., 2015), and traumatic brain injury (Leeds et al., 2014); neurodevelopmental disorders - schizophrenia (Lovestone et al., 2007) and autism (Portis et al., 2012), bipolar disorder (Beaulieu et al., 2004) or addiction (Perreault et al., 2014). GSK-3 is fundamentally implicated into the neurotransmitter function (Beaulieu et al., 2004; Beaulieu, 2012; Li et al., 2007), and synaptic plasticity (Peineau et al., 2009). It is a key integrator of dopamine and serotonin neurotransmission through the Akt signaling pathway. GSK-3 is also regulated by the NMDA receptors through protein phosphatases and by Wnt signaling in the Axin-β-catenin protein complex. GSK-3 is among interacting proteins with DISC1 (Lipina and Roder, 2014), directly binding to DISC1 scaffolding protein (Mao et al., 2009), and it is the downstream target of molecular complex DISC1 with dopamine D2 receptors (Su et al., 2014). GSK-3 is implicated into action of antipsychotics, mood stabilizers, and antidepressants (Beaulieu, 2012), supporting its implication into molecular mechanisms of psychiatric disorders. Given that overactive GSK-3 is implicated into pathogenesis of several mental disorders, there is a great interest to pharmacological GSK-3 inhibitors as potential effective therapeutic treatment. The first GSK-3 inhibitor described was lithium (Klein and Melton, 1996; Stambolic et al., 1996), which is still widely used in research and in clinics as a mood stabilizer. Lithium directly binds and inhibits GSK-3 (Klein and Melton, 1996; Stambolic et al., 1996) and increases the inhibitory phosphorylation of GSK-3 on serines (Jope, 2003). Many actions of lithium are mediated via GSK-3, but it also has other actions, including inhibition of inositol monophosphatase (Phiel and Klein, 2001). The efficacy of lithium and its capacity to decrease GSK-3 activity led to development of selective inhibitors of GSK-3 in the last decade (Eldar-Finkelman and Martinez, 2011). The multiple GSK-3 inhibitors have diverse chemical structures including ATP-competitive, non-ATP-competitive and substrate-competitive inhibitors and new compounds are still in progress. VP3.36 is a small heterocyclic, ATP-competitive, reversible compound with high specificity to inhibit GSK-3 inhibitor and penetrate into brain. All these characteristics make VP3.36 as an ideal compound to study GSK-3 inhibition in vivo and therefore it was selected for the present study. Pure cognitive effects of GSK-3 inhibitors have not been well studied yet on healthy animals or humans. However, this class of compounds may represent novel category of cognitive enhancers with further application to healthy individuals. Indeed, enhanced cognitive performance following chronic lithium treatment was found in several studies. So, lithium improved spatial working memory assessed in T-maze, facilitated long-term retention of passive avoidance (Tsaltas et al., 2007, Yuskaitis et al., 2010) and cued fear conditioning in mice (Watase et al., 2007). Lithium-treated rats improved spatial discrimination learning in hole-board test, increased their working memory and long-term memory in T-maze and social place-preference learning (Nocjar et al., 2007). Dual GSK-3 and PDE7 inhibitor – VP1.15 was able to improve spatial object recognition, working memory assessed in Y-maze, and long-term cued fear memory in mice (Lipina et al., 2013). However, several studies with selective GSK-3 inhibitors did not find positive effects on cognition in healthy mice or rats (Thotala et al., 2008; Guo et al., 2012; Tian et al., 2012). Such discrepancy may depend on experimental design (e.g. drug is given for 3 days for juvenile mice and delayed effects are observed); relevant cognitive task; chosen dose or type of injections. Therefore, efficacy of several GSK-3 inhibitors as cognitive enhancing drugs remains to be studied in near future to deeper understand impact of GSK-3 inhibition into mechanisms of synaptic plasticity in normal organism in order to carefully select effective regime of treatments with GSK-3 inhibitors to animal model of mental disorders. In fact, multiple studies already showed that GSK-3 blockers are able to improve cognition in a wide range of animal models of CNS disorders, including Alzheimer’ disease, Fragile X syndrome, Down syndrome, Parkinson’s disease, schizophrenia, and others (King et al., 2014). Although several groups of cognitive enhancers have been developed, including NMDA receptor agonists (d-serine, glycine transporter inhibitors), AMPA receptors modulators (e.g. AMPAkines, racetams) or acetylcholinesterase inhibitors, most of them have not produced convincingly clear beneficial effects to improve cognitive symptoms and often are recommended as supplementary medicine (Chouinard et al., 2007; Francis et al., 2012; Vreeker et al., 2015). Such unique capacity of GSK-3 inhibitors to rescue cognitive deficiencies seen in multiple models of mental disorders likely involves various mechanisms, including synaptic long-term potentiation (LTP) and diminishing long-term depression (LTD), neurogenesis, reduction of neuroinflammation, and strengthening neuroprotective mechanisms (King et al., 2014). The most direct mechanisms by which GSK-3 may regulate cognitive functions are LTP and LTD, which are components of synaptic plasticity. Induction of LTP increases serine-phosphorylation of GSK-3, whereas overactivation of GSK-3 disrupts LTP (Hooper et al., 2007; Zhu et al., 2007). Notably, that pharmacological GSK-3 inhibition did not induce clear effect on LTP in healthy mice (Peineau et al., 2007), whereas GSK-3 inhibitors robustly prevented induction of LTD (Peineau et al., 2007, 2008). Nevertheless, several studies directly demonstrated that GSK-3 inhibitors were able to correct impaired LTP\LTD together with their beneficial effects on deficient cognitive performance in mouse models of Fragile X syndrome (Choi et al., 2011; Franklin et al., 2013), Alzheimer’ disorder (Ma et al., 2010; Li et al., 2012), and Down syndrome (Contestable et al., 2013). Therefore, the main focus of our current study was to characterize: 1) biochemical features of the newly developed GSK-3 inhibitor, VP3.36; 2) its ability to act as a cognitive enhancer in various cognitive behavioral tasks; and 3) its capacity to prevent induction of synaptic LTD in normal naïve mice. C57BL/6J male mice were purchased from the Jackson Laboratory (Bar Harbor, ME) and were 8-10 weeks old upon arrival. They were housed five per cage under a 12 hours light/dark cycle (lights on at 07.00) with ad libitum food (Purina mouse chow) and were acclimatized for 1-2 weeks to the animal colony at the Samuel Lunenfeld Research Institute prior to the beginning of behavioral testing. Behavioral testing was conducted between 09.00-16.00 hours. Electrophysiological experiments were conducted on 15-25 day-old C57BL/6J mice bred in the animal facility of the Scientific Research Institute of Physiology and Basic Medicine. All animal procedures were approved by the Institutional Animal Care Committees and were conducted in compliance with state guidelines, the Canadian Council on Animal Care and the Russian Academy of Science based on ECC Directive 86/609/EEC. Human recombinant GSK-3b and the prephosphorylated polypeptide substrate were purchased from Millipore (Millipore Iberica S.A.U.). Kinase-Glo Luminescent Kinase Assay was obtained from Promega (Promega Biotech Ibérica, SL). ATP and all other reagents were from Sigma-Aldrich (St. Louis, MO). Assay buffer contained 50 mM HEPES (pH 7.5), 1 mM EDTA, 1 mM EGTA, and 15 mM magnesium acetate. The method of Baki et al., (2007) was followed to analyse the inhibition of GSK-3b. Kinase-Glo assays were performed in assay buffer using black 96-well plates. In a typical assay, 10 µl (10 µM) of test compound (dissolved in dimethyl sulfoxide (DMSO) at 1 mM concentration and diluted in advance in assay buffer to the desired concentration) and 10 µl (20 ng) of enzyme were added to each well followed by 20 µl of assay buffer containing 25 µM substrate and 1 µM ATP. The final DMSO concentration in the reaction mixture did not exceed 1%. After 30 min incubation at 30 °C the enzymatic reaction was stopped with 40 µl of Kinase-Glo reagent. Glow-type luminescence was recorded after 10 min using a FLUOstar Optima (BMG Labtechnologies GmbH, Offenburg, Germany) multimode reader. The activity is proportional to the difference of the total and consumed ATP. The inhibitory activities were calculated on the basis of maximal activities measured in the absence of inhibitor. The IC50 was defined as the concentration of each compound that reduces a 50% the enzymatic activity with respect to that without inhibitors. Prediction of the brain penetration was evaluated using a parallel artificial membrane permeability assay (PAMPA) (Di et al., 2003). Test compounds [(3–5 mg of Caffeine, Enoxacin, Hydrocortisone, Desipramine, Ofloxacin, Piroxicam, Testosterone), (12 mg of Promazine) and 25 mg of Verapamil and Atenolol] were dissolved in EtOH (1000 μL). One hundred microlitres of this compound stock solution was taken and 1400 μL of EtOH and 3500 μL of PBS pH 7.4 buffer were added to reach 30% of EtOH concentration in the experiment. These solutions were filtered. The acceptor 96-well microplate was filled with 180 μL of PBS/EtOH (70/30). The donor 96-well plate was coated with 4 μL of porcine brain lipid in dodecane (20 mg mL−1) and after 5 min, 180 μL of each compound solution was added. To determine the ability to pass the brain barrier, 1–2 mg of VP3.36 were dissolved in 1500 μL of EtOH and 3500 μL of PBS pH 7.4 buffer, filtered and then added to the donor 96-well plate. Then the donor plate was carefully put on the acceptor plate to form a “sandwich”, which was left undisturbed for 2 h and 30 min at 25 °C. During this time the compounds diffused from the donor plate through the brain lipid membrane into the acceptor plate. After incubation, the donor plate was removed and the concentration of all the compounds in both the acceptor and the donor wells were determined by the UV plate reader. The sample was analyzed at three to five wavelengths, in three wells and in two independent runs. Results are given as the mean (obtained from the average of two independent runs) ± standard deviation (SD). Ten quality control compounds (previously mentioned) of known BBB permeability were included in each experiment to validate the analysis set. The linear correlation between experimental and reported permeability of commercial drugs using the PAMPA-BBB assay together with permeability data of VP3.36 are gathered in Figure S1 and Table S1. Kinase profiling was performed using SelectScreen® Biochemical Kinase Profiling Service Z′-LYTE® from Invitrogen (Madison, WI) using a fixed compound concentration of 10 µM. Kinases evaluated: AKT1, AKT2, AKT3, AURKA, CAMK2D, CDK1/cyclin A, CDK2/cyclin B, CDK5/p25, CDK5/p35, CHEK1,CK1α1 CK1γ1, CK1δ, CK1ε, CK2α1, DYRK1A, EGFR, FGFR3, FLT1, FLT3, FRAP1, FYN, GSK3α, GSK3β, IGF1R, JAK1, LCK, MAPK8, MAPK10, MAPK11,MAPK12. MAPK13, MAPK14, MAPKAPK2, MARK1, PDGFRα, PDK1, PRKACA, PRKCα, PRKCβ1, PRKCδ, PRKCε, ROCK1, SGK2, SRC, STK3. Behavioral tests were done between 9 am and 4 pm on adult C57BL/6J mice (2-3 months of age). Prior to all experiments mice were acclimatized to the experimental room for 30 min. The behavioral equipment was cleaned with 70% ethanol between mice to remove residual odors. Independent cohorts of animals have been tested in each behavioral test to estimate pharmacological effects of VP 3.36. A mouse behavior in the elevated zero maze, forced swim test, Y-maze, spatial object recognition and the Puzzle box were scored semi automatically using event-recording software (Observer 5.0; Noldus Information Technology, Netherlands). The Y-maze task was performed as previously described (Lipina et al., 2013). The maze consists from a tree-arm horizontal maze (40cm x 8cm x 15cm) (Noldus Information Technology, The Netherlands) in which the arms are symmetrically disposed at 120o angles from each other. The maze floor and walls were constructed from grey opaque polyvinyl plastic with distinctive geometric shapes on walls. A mouse was initially placed in one arm and the sequence (i.e. ABCCAB) and number of arm entries were recorded for 5 minutes. Arm entries were defined as all four paws entering the arm. Spontaneous alternation refers to visiting all three arms in sequence (i.e. ABC or CAB but not CBC). The percentage of alterations was defined according to the following equation: % Alteration = [(Number of alterations)/(Total arm entries – 2)]*100. The number of arm entries serves as an indicator of ambulation. The spatial and novel object discrimination task was performed as described (Lipina et al., 2013) in a transparent Plexiglas open field (41×41×31 cm). The procedure consisted of three sessions – habituation to objects and two test sessions, with 2 min interval during which mice were returned to their home cage. The habituation: four identical plastic objects (chemical beaker for 100 ml) were flipped and placed in specific positions near each corner of the open field (5 cm from corner walls). A mouse was simultaneously released into center of the arena and the following behavioral parameters were recorded for 6 min using The Observer 5.0 (Noldus Information Technology, The Netherlands): time on objects - mice actively exploring the objects, usually by sniffing within 1 cm. Standing on objects was not considered as attending behavior; and freezing – animal passively sits on one place for > 3-5 sec with allowed slight movements of head. Next, mice were returned to the home cage and the four objects were reconfigured into a polygon-shaped pattern by moving two displaced objects (DOs) in the center. The remaining two objects were left at the same location (non-displaced objects (NDO)). After 2-min interval a mouse was placed in the center of the open field and time of exploration of the DOs and NDOs were recorded for 5 min (spatial object recognition). On the last session (novel object recognition) one NDO was replaced by novel object (NO) (cubic Rubika), another NDO was located in the same place (familiar object, FO) as in the previous session, and the other two DOs were removed from the apparatus. Mouse was placed into the center after 2 minutes interval, and time of exploration of FO and NO were recorded for another 5 min (novel object recognition). Time of exploration DO\NDO and FO/NO was expressed as a percentage of the total time of objects investigated. The protocol was performed as previously described (Lipina et al., 2013) and consisted from 3 session x 3 trials per session with inter-session interval 1.5 hour. The arena of Puzzle box consisted of a plexiglas white box divided by a removable barrier into two compartments: a brightly-lit start zone (58 cm x 28 cm) and a smaller covered goal zone (15 cm x 28 cm) (Lantz Enterprises Inc., Hamilton, Canada). Introduced into the start zone, mice were trained to move into the goal zone through a narrow underpass (~4 cm wide) located under the barrier. On session1 (training), the underpass was un-blocked, and the barrier had an open door over the location of the underpass during trial 1 (T1). On T2 and T3 the barrier had no doorway and mice entered via the small underpass. On session 2 (burrowing puzzle), T4 was identical to T2 and T3, but on T5 and T6 the underpass was filled with sawdust and mice had to dig their way through. On session 3 (plug puzzle), T7 was similar to T5 and T6 and on T8 and T9, mice were presented with the plug puzzle, with the underpass obstructed by a plug (piece of washcloth) that mice had to push with front paws and snout to enter the goal zone. This sequence allowed assessing problem solving ability (T5 and T8), and learning/short-term memory for species-specific or instrumental responses (T3, T6, and T9), while the repetition after 1 hour provided a measure of long-term memory (T4 and T7). Each trial started by placing the mouse in the start zone, and ended when the mouse entered the goal zone with all four paws, or after a total time of 4 min. Performance of mice in the puzzle box was assessed by measuring the latency to enter the goal zone. Contextual and cued fear conditioning was conducted as previously described (Lipina et al., 2013). Briefly, a fear conditioning apparatus (MED Associates Inc., Georgia, VT, USA) consisting of a test chamber (25 cm high x 30 cm wide x 25 cm deep) was cleaned prior to testing with 70% ethanol. Freezing, as the complete absence of any movement except respiration and heartbeat, was recorded using automated fear conditioning software (ACTIMETRICS software, FREEZEFRAME v. 1.6e) and presented as a percentage of total time. Mice were removed from home cage and allowed to explore the chamber for 2 min. The conditioning session consisted of two pairings of an auditory cue (3.6 kHz, 75 dB, 30 sec), a conditioned stimulus (CS), followed by a foot-shock (2s, 0.75 mA), unconditioned stimulus (US) with a 1 minute inter-trial interval. Mice were removed from the chamber 2 minutes later and returned to their home cage. Approximately 24 h later, each mouse was returned to the test chamber and monitored for 8 min (contextual fear conditioning). Cued fear conditioning (fear memory to the tone) was evaluated 24 h after the context test. Each mouse was placed into a novel context (novel odour, lighting, background noise, chamber floor, shape of the chamber and visual cues) of the fear conditioning chamber and allowed 3 min for exploration, after which the auditory tone cue of 8 min was delivered and after another 3 min a mouse was returned to the home cage. Morris’ water-maze was conducted as previously described (Clapcote et al., 2007). The water maze consisted of a 185-cm diameter cylindrical tank that contained a 15-cm circular platform and water (26 ± 1oC) rendered opaque by the addition of white nontoxic paint. The training regime consisted of pre-training session to a visible (V) platform for 1 d (four trials; maximum duration, 90 s; inter-trial interval [ITI], 30 min) followed by training session to a submerged platform in the northeast quadrant (NE) for 5 days (days 1–5; six trials per day; maximum duration, 90 s; ITI, 30 min), followed by “reversal” training session for 3 days (R1-R3; six trials per day; maximum duration, 90 s; ITI, 30 min) to a submerged platform relocated to the southwest quadrant (SW). 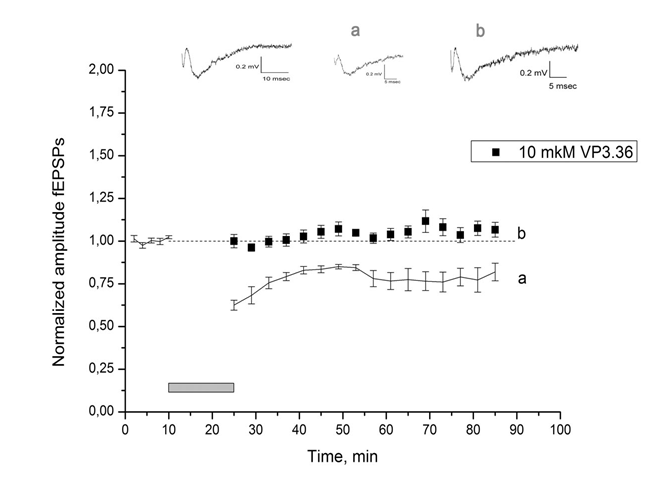 A retention trial (90 s duration) with the platform removed from the pool was given 24 h after the last acquisition trial to the NE and again 24 hr after the last training trial to the SW.
VP3.36 was synthesized following described procedures (Perez et al., 2011) and dissolved in 0.9% NaCl and injected intraperitoneally (i.p.) 30 min prior to the experimental session. Dose of VP3.36 (3 mg/kg) was chosen based on the literature (Lipina et al, 2013). VP3.36 was given acutely in all tests, including conditioning session of fear conditioning procedure, however the drug was injected sub-chronically for 5 days during the training session in the Morris’ water-maze test. The drug was administrated in a volume 10 ml/kg. Horizontal hippocampal slices (400 µm thick) were prepared from 15–25 day-old mice that were killed by cervical dislocation. The brain was rapidly removed, and slices were prepared in ice-cold solution using a vibroslicer (NVSL, World Precision Instruments). The slices were allowed to recover for at least 1 hr before an experiment in artificial CSF (ACSF), saturated with 95% O2 and 5% CO2 and were then transferred to a experimental chamber for extracellular recordings. The flow rate of the solution through the chamber was 1 ml/min. The composition of the ACSF was 124 mMNaCl, 4.4 mMKCl, 26 mM NaHCO3, 1 mM NaH2PO4, 2.5 mM CaCl2, 1.3 mM MgSO4 and 10 mM D-glucose, bubbled with a 95% O2–5% CO2 mixture, and had a final pH of 7.4. All experiments were performed at room temperature. Part of the slices before electrophysiological experiments incubated in ACSF containing 10 µM VP3.36 for 4 hours at room temperature. VP3.36 was added into experimental solution in final concentration 10 µM. Extracellular recordings of field excitatory postsynaptic potentials (fEPSPs) were obtained from the stratum radiatum of the CA1 region of the hippocampus using glass micropipettes (3–6 MΩ) filled with ACSF (DigiData 1200 and pClamp software, Axon Instruments Inc., USA; MEZ-8201, Nihon Kohden, Japan). Stimulus was applied to the Schaffer collateral via a concentric bipolar stainless steel electrode (A 360, World Precision Instruments). Stimulation intensity (0.1ms pulse duration) was adjusted to evoke fEPSP amplitudes that were 40-50% of maximal size. Subsequent fEPSPs were elicited once per 2 minute at this stimulation intensity. For LTD induction, low-frequency stimulation (1 Hz/900 pulses) was applied to the Schaffer collateral–commissural pathway via a concentric bipolar stainless steel electrode. Amplitudes of fEPSPs were normalized with respect to the 10-min control period before low frequency stimulation. Data are presented as mean ± SEM. High frequency stimulation (HFS; three 1 s trains at 100 Hz, intertrain interval 20 s) was used to induce LTP. Amplitudes of fEPSPs were normalized with respect to the 10-min control period before HFS. Data also are presented as mean ± SEM. Statistical analyses were completed using Statistica for Windows (Statsoft 5.5, Tulsa, OK, USA). Behavioral data were analyzed using one-way ANOVA with repeated-measures with the appropriate between-subjects and within-subjects factors. Significant main effects or interactions were followed by Fisher’s least significant difference (LSD) post hoc comparisons. VP3.36 is a small heterocyclic GSK-3 inhibitor (MW < 500) designed from the X-ray crystallographic structure 1R0E (Figure 1a). The inhibitor’ structure was simplified to enable a simple chemical synthesis while preserving key motifs for target binding such as the maleimide core. This inhibitor was developed together with a very structurally similar compound that allows for irreversible GSK-3 inhibition, providing an ideal tool for enzyme inhibition modulation (Perez et al., 2011). The binding mode of VP3.36 to GSK-3 was studied using a luminescent assay methodology (Baki et al., 2007). It was found that VP3.36 did not increase inhibition of GSK-3 with time (Figure 1b) but expressed ATP competitive inhibition of GSK-3 (Figure 1c). Since ATP-competitive inhibitors may have selectivity in vivo issues, a kinase profiling over a panel of fifty different human kinases was performed using a fixed concentration of VP3.36 at 10 mM. VP3.36 shows a high selectivity profile targeting both isoforms of GSK-3, α and β (binding at 82 and 90%, respectively) and with lower potency AKT 1 and 2 (binding at 49 and 64%, respectively) (Figure 1d). Using an in vitro model for blood brain barrier (BBB) permeability prediction based in parallel artificial membranes, it was established that VP3.36 is able to penetrate into the brain with a value of effective permeability (Pe) of 6.4 ± 1.5 10-6 cm s-1 (Table S1). 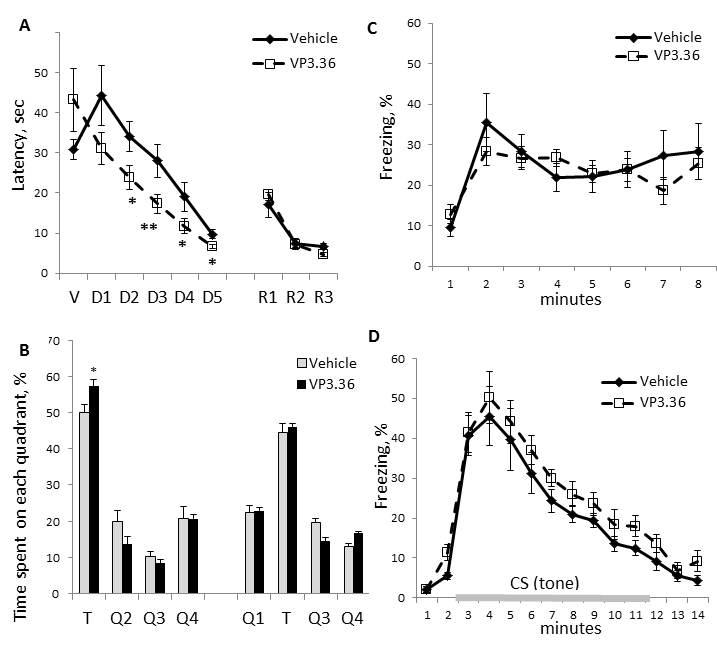 There was no difference in total number of visited arms between vehicle- and VP3.36-treated mice (22.7 ± 1.7 and 19.4 ± 0.8, respectively) [F1,11 = 3.2; p >0.05]. However, the drug was able to increase number of alterations in this task [F1,11 = 6.9; p < 0.05] (Figure 2a). Habituation session: Exploration of objects during the habituation session was analyzed as three sessions (S1-S3) by 2 minutes interval each. ANOVA with repeated measures detected a main effect of the drug treatment [F1,13 = 36.9; p < 0.001], effect of habituation between sessions VP3.36-treated mice spent [F2,26 = 139.8; p < 0.001] and their interactions [F2,26 = 11.7; p < 0.001]. VP3.36-treated mice spent significantly more time on objects during the first 2 minutes of the habituation (session 1; S1 (p < 0.01) and in the second 2 minutes of the habituation sessions as compared to vehicle-treated animals (session 2; S2 (p < 0.001) (Figure 2b). Mice of both experimental groups similarly declined their activity on the last 2 minutes of habituation (session 3, S3). Spatial object recognition session: Figure 2(c) illustrates the percentage of time spent near non-displaced (NDO) and displaced objects (DO) in vehicle- and VP3.36- treated mice. ANOVA found a main effect of the type of object [F1,13 = 7.56; p < 0.05] and drug x type of object interactions [F1,13 = 11.2; p < 0.01]. 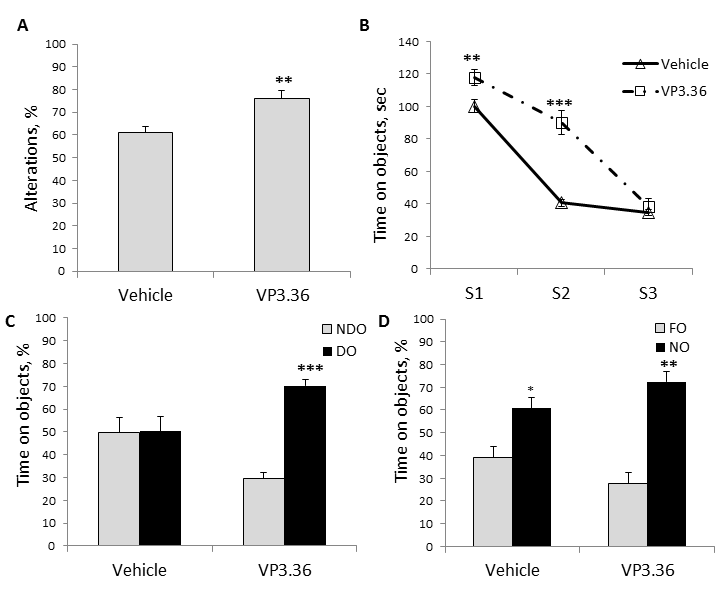 Post-hoc analysis revealed that the VP3.36-treated mice preferred to spend time near DO rather than on NDO (p < 0.001), whereas vehicle-treated mice did not recognize spatial changes following short habituation, spending equal amount of time on both types of object (p > 0.05). Novel object recognition: Figure 2(d) shows the percentage of time spent near the novel (NO) and familiar object (FO) in experimental animals. ANOVA detected a main effect of the type of object [F1,13 = 22.8; p < 0.001] and drug x type of object interactions [F1,13 = 4.91; p < 0.05]. As can be seen, vehicle- and VP3.36-treated mice spent more time near NO (p < 0.05 and p < 0.01, respectively) rather than near FO. 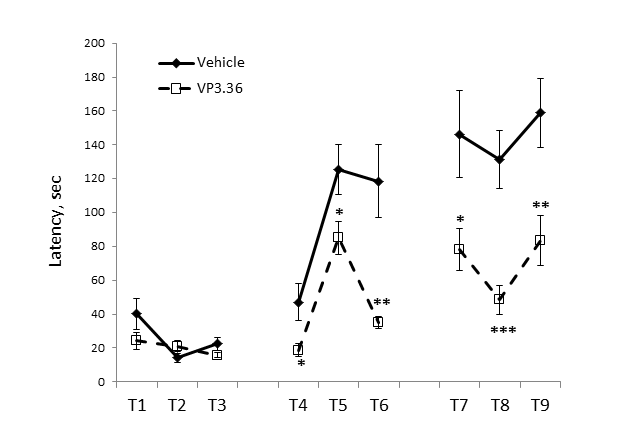 Figure 3 depicts the latency to enter the goal box in vehicle- and VP3.36-treated mice among all trials. ANOVA with repeated measures found a main effect of trials [F8,128] = 32.14; p < 0.001], drug [F1,16 = 7.8; p < 0.01] and their interactions [F8,128 = 5.5; p < 0.001]. Post-hoc comparison revealed that VP3.36-treated mice found faster the escape into the goal box than control group during the obstacle T5 and T8 (p < 0.05 and p < 0.001, respectively). VP3.36-treated mice demonstrated better retention of the solved obstacles across the blocks as observed by shorter latencies on repeated trials T6 and T9 compared to vehicle-treated mice (both p’s < 0.01) as well as between blocks, after delays on trials T4 and T7 (both p’s < 0.05). Figure 4 (a-b) shows latency to find the platform in Morris water maze across of training days with six training trials per day (Figure 4a) and retention trials (Figure 4b). ANOVA with repeated measures found a main effect of training days [F5,100 = 18.4; p < 0.001] and drug x training days interactions [F5,100 = 4.8; p < 0.001]. Experimental animals did not differ on the 1st day to find a visible platform in the pool (V). VP3.36-treated mice showed better spatial learning to find the hidden platform across training days from day 2 to day 5 (D2-D5) (p’s < 0.05 on D2, D4 and D5, p < 0.01 on D3). Figure 4(b) illustrates percentage of time spent in each quadrant of the water maze after training days to the north-east (NE) target (T) quadrant. ANOVA with repeated measures found a main effect of the target quadrant [F 3,60 = 103.0; p < 0.001] and drug x type of quadrant interactions [F3,60 = 3.0; p < 0.05]. VP3.36 had no effect on reversal spatial learning (Figure 4a; R1-R3) and retention (Figure 4b). ANOVA found a main effect of reversal training days [F2,40 = 51.5; p < 0.001], but no effect of drug or their interactions (both p’s > 0.05). There was no effect of the drug also on retention task after reversal learning session. ANOVA detected a main effect of the type of quadrant [F3,60 = 152; p < 0.001]. However, there was no effect of the drug or its interaction with type of quadrant (both p’s > 0.05). Figure 4 (c,d) depicts the percentage of freezing behavior in response to the fearful context (Figure 4c) and the conditioned stimulus (CS; tone) (Figure 4d). ANOVA with repeated measures found a main effect of the testing intervals [F7,147 = 10.5; p < 0.001], but there was no effect of the drug or their interactions on the contextual fear conditioning (p’s > 0.05). ANOVA with repeated measures also detected a main effect of the testing intervals [F13,286 = 51.0; p < 0.001] without effect of VP3.36 treatment or testing intervals x drug interactions (both p’s > 0.05) on the cued fear conditioning. We applied VP3.36 (10 mkM) to the perfusing solution and used extracellular recording to investigate its effects on LTD and LTP. Incubation with 10 mkM VP3.36 up to 3 hours had no effect on LTD and LTP induction. All results reported below obtained by incubating slices with 10 mkM VP3.36 for 4 hours. VP3.36 had no effect on baseline synaptic transmission (data not shown), but it blocked the induction of LTD (Figure 5) induced by low-frequency stimulation (900 stimuli delivered at 1 Hz; n = 6). Thus, 60 min following LFS, the amplitude of the field excitatory postsynaptic potential (fEPSP) of VP3.36-treated slices was 1.06±0.04 of baseline (n = 6) compared with 0.819±0.05 of baseline (n=5) for untreated slices (p < 0.05). In VP3.36-treated slices LTP was readily induced by HFS tetanic stimulation (data not shown). Therefore, of the two major forms of synaptic plasticity studied, VP3.36 specifically blocked the induction of LTD but had no effect on LTP. In the present study we found that VP3.36 was able to facilitate specific cognitive domains in normal naïve mice - working memory, executive functions, episodic spatial novelty detection, long-term spatial learning and memory, however had no effect on fear memories. In addition, the GSK-3 inhibitor robustly prevented synaptic LTD in the hippocampal CA1 subregion. Overall, our new findings provided support for GSK-3 as essential molecular player implicated into mechanisms of synaptic plasticity, and suggested that prevention of LTD may accompany specific cognitive enhancement in healthy mammals. Attempts to improve cognitive functions in patients with various mental disorders have become the major focus of intensive research efforts (Parton et al, 2005). So, drugs acting on noradrenergic and dopaminergic neurotransmission, i.e. methylphenidate and atomoxetine, are actively used to treat attention deficit hyperactivity disorder (ADHD) (Findling, 2006). For Alzheimer’s and Parkinson’s neurodegenerative disorders, memantine (NMDA receptor’ antagonist), and acetylcholinesterase inhibitors are standard treatments (Emre et al, 2004; Reisberg et al, 2003). Cognitive deficits observed in schizophrenia are difficult to treat by known antipsychotics and thus, various putative cognitive enhancers, including NMDA receptor antagonists, muscarinic antagonist scopolamine and dopaminergic agonist amphetamine were assessed in patients (Barak and Weiner, 2011), although with little impact on cognitive functions. If the main aim in animal research on cognitive enhancement is to develop compounds to ameliorate cognitive deficits associated with e.g. schizophrenia, then it should be asked how these drugs may affect cognition in normal individuals. For instance, typical antipsychotics, sulpiride or clozapine ameliorated attentional deficit or working memory deficit in animals with disrupted prefrontal cortical functions but these antipsychotics impaired performance of control animals (Murphy et al, 1997; Passeti et al, 2003a,b; Baviera et al, 2008). Hence, there is an important discussion in the field whether interventions that will improve cognition in patients with mental disorders can be also successfully detected in healthy subjects. Moreover, development of cognitive enhancers for mental patients attracted a great interest of researchers to create such drugs also for healthy individuals. Indeed, such compound as modafinil, which rescue cognitive deficits in patients with ADHD or schizophrenia (Turner et al, 2004a,b), are widely used now by e.g. students, military personnel or university academicians to improve their cognitive performance (Farah et al, 2004; Greely et al, 2008; Sahakian and Morein-Zamir, 2007), hence, providing a strong support that drug discovery in normal animals is an endorsable strategy. What cognitive domains are facilitated by GSK-3 inhibition in naïve mice? Before assessing cognitive effects of the studied compound on naïve animals, the attention must be paid to the selection of cognitive tasks. Given that GSK-3 inhibitors showed beneficial effects on cognitive deficits in various animal models of mental disorders (King et al, 2014), our set of cognitive tasks estimated working memory, spatial\novel object recognitions, executive functioning, spatial learning & memory and contextual & cued associated fear memory in healthy mice. These tests are commonly used in animals to measure cognitive capacities, related to schizophrenia, Alzheimer’ disorder, Parkinson’s disease or Down’ syndrome (Barak and Weiner, 2011; Bondi et al, 2008; Rueda et al, 2012). The spontaneous alteration task is used to assess spatial working memory in mice and based on the natural motivation of animal to explore a prior unvisited arm of Y-maze. Studies in laboratory animals mostly assess working memory as the ability to use multi-component system to rapidly encode, temporarily maintain and utilize information in the given task in order to efficiently update memory system and affect in real time on-going behavior (Goldman-Rakic, 1987; Baddeley, 2010). Working memory enhancement is coupled with several brain neurotransmitter’s systems, including cholinergic system (Bontempi et al, 2003; Tietje et al, 2008), catecholamine (Berridge et al, 2006; Arnstein and Dudley, 2005), AMPA and metabotropic glutamate receptors (Hampson et al, 1998) and with little evidence for 5-HT system (Terry et al, 2005). GSK-3 is a downstream of dopamine D2 receptors and 5-HT2A and 1A\B receptors (Beaulieu, 2012; Polter and Li, 2011). Recent study also linked GSK-3 with acetylcholinergic neurotransmitter' system via its capacity to regulate access of KCNQ2 channel on neuronal surface and hence, functioning of muscarinic acetylcholine receptors (Jiang et al, 2015). Moreover, in vivo study showed that deficit of Akt1, direct regulator of GSK-3 activity, was associated with poor working memory in the mouse model of schizophrenia induced by maternal immune activation (Bitahiharwe et al 2010), suggesting that Akt1 might contribute into cognitive effects of GSK-3 inhibition. Evidence to support a crucial role for LTD in working memory came from specific genetic alterations and generation of pharmacological compounds which specifically affect LTD but not LTP. So, genetic disruption of forebrain calcineurin impairs LTD at Schaffer collateral-CA1 synapses and knockout mice showed deficient working and episodic memories (Zheng et al, 2001), directly linking abolished LTD in the hippocampus with insufficient working memory in mice. In the current study inhibition of GSK-3 by VP3.36 sufficiently prevented synaptic LTD at CA1 hippocampal synapses and VP3.36-treated mice showed enhancement of working memory, supporting GSK-3 in the mechanisms of LTD and modulation of fundamental processes of working memory. Perturbations in the dopamine or glutamate systems can generate robust and reliable impairment in spatial object recognition. Impaired performance is also seen following antagonism of the muscarinic acetylcholine system, or exposure to cannabinoid agonists. In opposite, cognitive enhancement has been reported using alpha7-nicotinic acetylcholine receptor agonists and 5-HT6 antagonists (Lyon et al, 2012). Several brain regions are involved in such type of learning, including perirhinal cortex, prefrontal cortex and hippocampus (Hannesson et al, 2004; Lee et al, 2002). So, scopolamin, the muscarinic receptor antagonist, blocked LTD in perirhinal neurons and impaired novel object recognition memory in mice (Warburton et al, 2003). The decreased LTD on hippocampal slices of mice with functional loss of dysbindin was associated with deficient novel object recognition (Bhardwaj et al, 2015). The direct association between LTD and object discrimination was shown on transgenic mice with persistent inhibitory autophosphorylation of calcium\calmodulin-dependent kinase II (CAMK II), which expressed stronger LTD in response to novel object recognition (Goh and Manahan-Vaughan, 2015). Our findings found that VP3.36 prevented LTD on hippocampal slices and elicited facilitating effect on spatial object recognition in C57BL/6 mice similarly to VP1.15 – dual inhibitor of GSK-3 and PDE7 (Lipina et al, 2013), supporting the role of GSK-3 in modulating episodic memory. Notably, that novel object recognition was only slightly enhanced by VP3.36 in comparison with the drug’s effect on the spatial object discrimination task. Such selective influence of VP3.36 on spatial object recognition rather than on novel object recognition per se might be explained that the former task depends more directly on the function of the hippocampus (Barker and Warburton, 2011), whereas the novel object recognition does not depend on function of the hippocampus based on the lesion’ study in mice (Sannino et al, 2012). Hence, VP3.36 likely elicits its cognitive facilitating influence on episodic memory through the hippocampal molecular-cellular mechanisms. In brief, executive functions reflect such cognitive processes that help to maintain an appropriate problem-solving set to achieve a final goal (Pennington and Ozonoff, 1996). Many problems require coordinated and simultaneous encoding and\or retrieval of different memories across multiple systems with integration of necessary information in order to effectively solve these obstacles. The puzzle box is a problem-solving test in which mice are required to escape open box into the shelter with increasing difficulty within a limited amount of time. It is well known that prefrontal cortex (Fuster, 2008) and the hippocampus (Ben Abdallah et al, 2011) play essential roles in mediating various executive functions. VP3.36-treated mice solved new obstacles in the puzzle box faster than control animals (T5, T8, Figure 3), supporting thereby cognitive enhancement effects of GSK-3 inhibitor in this task. Moreover, GSK-3 inhibitor was also able to improve retention of the solved problems after short-term and long-term delays, indicating that the facilitating effect of the drug is elicited on several cognitive functions. The association of LTD and executive functioning was suggested based on neurodevelopmental hypothesis that the increasing complexity of the prefrontal cortex is coupled with maturation of LTD and as result with raising ability of adults to solve effectively complex problems\obstacles than in adolescence (Selemon, 2013). The puzzle box is still a novel task in mice and more pharmacological studies utilizing this task are desired in order to compare efficacy of various compounds to speed up problem solving in parallel with their abilities to alter synaptic plasticity. The contributions of hippocampal long-term depression and, especially its molecular mechanisms, to spatial learning and memory are still poorly understood. For example, the NMDA receptor co-agonist d-serine enhanced NR2B-dependent LTD in hippocampal slices of C57BL/6J mice. Exogenous d-serine did not alter water-maze’ acquisition, but enhanced subsequent reversal learning of a novel target location (Duffy et al, 2008). Conversely, an NR2B antagonist disrupted reversal learning and promoted perseveration while preventing LTD. Similarly, the impaired hippocampal LTD in dopamine transporter knockout mice was also associated with disrupted reversal learning (Morice et al, 2007). However, recent work with fluoxetine, selective 5-HT reuptake inhibitor, found that the drug prevented hippocampal CA1 LTD induced by elevated-platform stress and facilitated spatial learning & memory in rats (Han et al, 2015), similarly to the effects of VP3.36 on spatial learning and memory in the current study. Overactive GSK-3 in the hippocampus is reported to be linked to deficient spatial learning and memory in several studies, including e.g. aldehyde dehydrogenase2 knockout mice (Aldh2-KO) as a model of Alzheimer disorder (D’Souza et al, 2015), whereas pharmacological inhibition of GSK-3 by benfotiamine improved performance of the amyloid precursor protein\presinilin-1 transgenic mice in the water maze task (Pan et al, 2010). In contrast to the effect of VP3.36 on the spatial learning & memory, the drug did not alter the contextual or cued fear memory in mice. Indeed, electrophysiological and behavioral studies found strong association between amygdala LTD and fear extinction but not fear acquisition and its retrieval (Yu et al, 2010; Quirk and Mueller, 2008). For example, the Tat-GluA23γ peptide prevented expression of amygdala LTD and disrupted the extinction of fear memory without affecting the acquisition or expression of fear conditioning in mice (Dalton et al, 2008). However, the amygdala LTD and fear extinction were beyond the scope of our current study. Hence, our findings indicate that GSK-3 dependent prevention of hippocampal LTD is implicated into modulation of the spatial cognition in the water maze such as spatial acquisition & retrieval, but not into processes of behavioral flexibility assessed by reversal spatial learning and memory or expression of long-term fear memory. Taken together, we showed that GSK-3 inhibition by VP3.36 selectively ameliorated such cognitive domains as working memory, executive functions, spatial object recognition and spatial acquisition & memory without any effect on ambulation, anxiety, behavioral despair, sensorimotor gating, startle response (Figure S2) and fear memory. Moreover, GSK-3 inhibitor specifically prevented hippocampal LTD but had no effect on LTP. Overall, our experiments showed implication of GSK-3 into mechanisms of synaptic plasticity and certain cognitive functions which help to deeper understand fundamental molecular-cellular mechanisms of cognitive enhancement’s processes. However, given that GSK-3 is involved into such functions as glucose regulation, apoptosis, intracellular signaling, neuronal inflammation, and neurodevelopment (Kim and Snider, 2011), caution must be paid to potential side effects of GSK-3 inhibitors, especial its long-term usage. Nevertheless, further studies with specific GSK-3 inhibitors are needed in order to assess its effects on synaptic plasticity in different neural sub-populations in parallel with its capacity as a novel cognitive enhancer in array of complex cognitive tasks. The work was partially supported by Presidium of the Russian Academy of Sciences (program IV.12.1, 2015-17) and Spanish Economy and Competitiveness Ministry (MINECO, grant # SAF2012-37979-C03-01). Arnsten, A.F., Dudley, A.G., 2005. Methylphenidate improves prefrontal cortical cognitive function through alpha2 adrenoceptor and dopamine D1 receptor actions: Relevance to therapeutic effects in Attention Deficit Hyperactivity Disorder. Behav Brain Funct. 1:2. Baddeley, A., 2010. Working memory. Curr Biol. 20: R136-R140. Baki, A., Bielik, A., Molnár, L., Szendrei, G., Keserü, G.M., 2007. 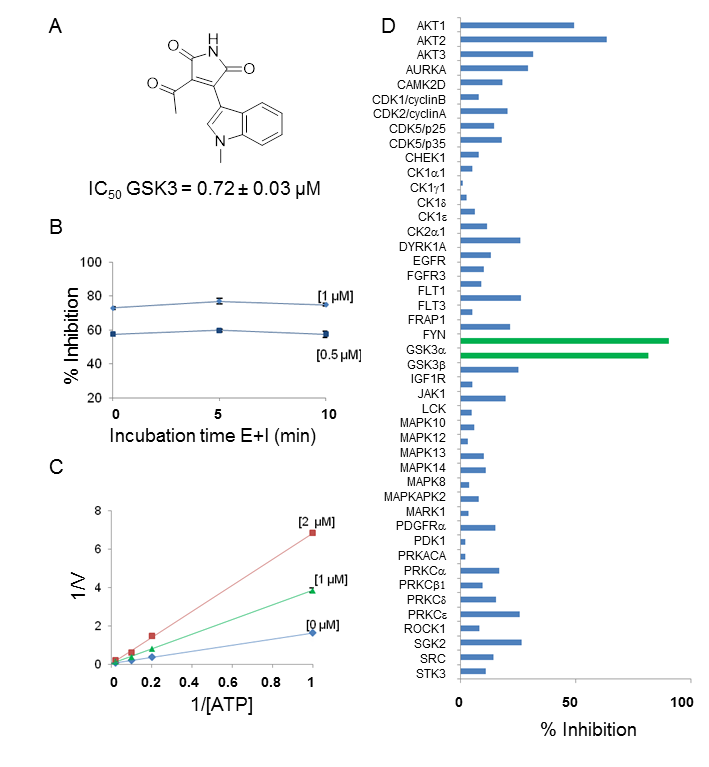 A high throughput luminescent assay for glycogen synthase kinase-3beta inhibitors. Assay Drug Dev Technol. 5:75-83. Barak, S., Weiner, I., 2011. Putative cognitive enhancers in preclinical models related to schizophrenia: the search for an elusive target. Pharmacol Biochem Behav. 99:164-189. Barker, G.R., Warburton, E.C., 2011. When is the hippocampus involved in recognition memory? J Neurosci. 31:10721-1031. Baviera, M., Invernizzi, R.W., Carli, M., 2008. Haloperidol and clozapine have dissociable effects in a model of attentional performance deficits induced by blockade of NMDA receptors in the mPFC. Psychopharmacology (Berl). 196:269-280. Beaulieu, J.M., Sotnikova, T.D., Yao, W.D., Kockeritz, L., Woodgett, J.R., Gainetdinov, R.R., Caron, M.G., 2004. Lithium antagonizes dopamine-dependent behaviors mediated by an AKT/glycogen synthase kinase 3 signaling cascade. Proc Natl Acad Sci U S A. 101:5099-50104. Beaulieu, J.M., 2012. A role for Akt and glycogen synthase kinase-3 as integrators of dopamine and serotonin neurotransmission in mental health. J Psychiatry Neurosci. 37:7-16. Ben Abdallah, N.M., Fuss, J., Trusel, M., Galsworthy, M.J., Bobsin, K., Colacicco, G., Deacon, R.M., Riva, M.A., Kellendonk, C., Sprengel, R., Lipp, H.P., Gass, P., 2011. The puzzle box as a simple and efficient behavioral test for exploring impairments of general cognition and executive functions in mouse models of schizophrenia. Exp Neurol. 227: 42-52. Beurel, E., Jope, R.S., 2006. The paradoxical pro- and anti-apoptotic actions of GSK3 in the intrinsic and extrinsic apoptosis signaling pathways. Prog Neurobiol. 79: 173-189. Berridge, C.W., Devilbiss, D.M., Andrzejewski, M.E., Arnsten, A.F., Kelley, A.E., Schmeichel, B., Hamilton, C., Spencer, R.C., 2006. Methylphenidate preferentially increases catecholamine neurotransmission within the prefrontal cortex at low doses that enhance cognitive function. Biol Psychiatry. 60: 1111-1120. Bhardwaj, S.K., Ryan, R.T., Wong, T.P., Srivastava, L.K., 2015. Loss of dysbindin-1, a risk gene for schizophrenia, leads to impaired group 1 metabotropic glutamate receptor function in mice. Front Behav Neurosci. 9:1-11. Bitanihirwe, B.K., Weber, L., Feldon, J., Meyer, U., 2010. Cognitive impairment following prenatal immune challenge in mice correlates with prefrontal cortical AKT1 deficiency. Int J Neuropsychopharmacol.13:981-996. Bondi, M.W., Salmon, D.P., Galasko, D., Thomas, R.G., Thal, L.J., 1999. Neuropsychological function and apolipoprotein E genotype in the preclinical detection of Alzheimer's disease. Psychol Aging. 14: 295–303. Bontempi, B., Whelan, K.T., Risbrough, V.B., Lloyd, G.K., Menzaghi, F., 2003. Cognitive enhancing properties and tolerability of cholinergic agents in mice: a comparative study of nicotine, donepezil, and SIB-1553A, a subtype-selective ligand for nicotinic acetylcholine receptors. Neuropsychopharmacology. 28: 1235-1246. Boyle, W.J., Smeal, T., Defize, L.H., Angel, P., Woodgett, J.R., Karin, M., Hunter, T., 1991. Activation of protein kinase C decreases phosphorylation of c-Jun at sites that negatively regulate its DNA-binding activity. Cell. 64: 573-584. Clapcote, S.J., Lipina, T.V., Millar, J.K., Mackie, S., Christie, S., Ogawa, F., Lerch, J.P., Trimble, K., Uchiyama, M., Sakuraba, Y., Kaneda, H., Shiroishi, T., Houslay, M.D., Henkelman, R.M., Sled, J.G., Gondo, Y., Porteous, D.J., Roder, J.C., 2007. Behavioral phenotypes of Disc1 missense mutations in mice. Neuron. 54:387-402. Cross, D.A., Alessi, D.R., Cohen, P., Andjelkovich, M., Hemmings, B.A., 1995. Inhibition of glycogen synthase kinase-3 by insulin mediated by protein kinase B. Nature. 378: 785-789. Choi, C.H., Schoenfeld, B.P., Bell, A.J., Hinchey, P., Kollaros, M., Gertner, M.J., Woo, N.H., Tranfaglia, M.R., Bear, M.F., Zukin, R.S., McDonald, T.V., Jongens, T.A., McBride, S.M., 2011. Pharmacological reversal of synaptic plasticity deficits in the mouse model of fragile X syndrome by group II mGluR antagonist or lithium treatment. Brain Res. 1380:106-119. Chouinard, S., Sepehry, A.A., Stip, E., 2007. Oral cholinesterase inhibitor add-on therapy for cognitive enhancement in schizophrenia: a quantitative systematic review, Part I. Clin Neuropharmacol. 30: 169-182. Contestabile, A., Greco, B., Ghezzi, D., Tucci, V., Benfenati, F., Gasparini, L., 2013. Lithium rescues synaptic plasticity and memory in Down syndrome mice. J Clin Invest. 123: 348-361. Dajani, R., Fraser, E., Roe, S.M., Young, N., Good, V., Dale, T.C., Pearl, L.H., 2001. Crystal structure of glycogen synthase kinase 3 beta: structural basis for phosphate-primed substrate specificity and autoinhibition. Cell. 105: 721–732. Dalton, G.L., Wang, Y.T., Floresco, S.B., Phillips, A.G., 2008. Disruption of AMPA receptor endocytosis impairs the extinction, but not acquisition of learned fear. Neuropsychopharmacology. 33: 2416-2426. Davies, S.P., Reddy, H., Caivano, M., Cohen, P., 2000. Specificity and mechanism of action of some commonly used protein kinase inhibitors. Biochem J. 351:95-105. Di, L., Kerns, E.H., Fan, K., McConnell, O.J., Carter, G.T., 2003. High throughput artificial membrane permeability assay for blood-brain barrier. Eur J Med Chem. 38:223-232. Duffy, S., Labrie, V., Roder, J.C., 2008. D-serine augments NMDA-NR2B receptor-dependent hippocampal long-term depression and spatial reversal learning. Neuropsychopharmacology. 33:1004-1018. Eldar-Finkelman, H., Martinez, A., 2011. GSK-3 Inhibitors: Preclinical and Clinical Focus on CNS. Front Mol Neurosci. 4:32. Emre, M., Aarsland, D., Albanese, A., Byrne, E.J., Deuschl, G., De Deyn, P.P., Durif F, Kulisevsky, J., van Laar, T., Lees, A., Poewe, W., Robillard, A., Rosa, M.M., Wolters, E., Quarg, P., Tekin, S., Lane, R., 2004. Rivastigmine for dementia associated with Parkinson's disease. N Engl J Med. 351:2509-25018. Fang, X., Yu, S.X., Lu, Y., Bast, R.C.Jr., Woodgett, J.R., Mills, G.B. 2000. Phosphorylation and inactivation of glycogen synthase kinase 3 by protein kinase A. Proc Natl Acad Sci USA. 97: 11960-11965. Farah, M.J., Illes, J., Cook-Deegan, R., Gardner, H., Kandel, E., King, P., Parens E, Sahakian B, Wolpe PR., 2004. Neurocognitive enhancement: what can we do and what should we do? Nat Rev Neurosci. 5:421-425. Franklin, A.V., King, M.K., Palomo, V., Martinez, A., McMahon, L.L., Jope, R.S., 2014. Glycogen synthase kinase-3 inhibitors reverse deficits in long-term potentiation and cognition in fragile X mice. Biol Psychiatry. 75:198-206. Francis, P.T., Parsons, C.G., Jones, R.W., 2012. Rationale for combining glutamatergic and cholinergic approaches in the symptomatic treatment of Alzheimer's disease. Expert Rev Neurother. 12:1351-1365. Findling, R.L., 2008. Evolution of the treatment of attention-deficit/hyperactivity disorder in children: a review. Clin Ther. 30:942-957. Fuster, J.M., 2008. The prefrontal Cortex, 4th edition, Academic Press: San Diego. Goldman-Rakic, P.S., 1987. Circuitry of the primate prefrontal cortex and the regulation of behavior by representational memory. In: Plum F (ed). Handbook of Physiology, the Nervous System, Higher Functions of the Brain. American Physiological Society: Bethesda, MD, 373-417. Goh, J.J., Manahan-Vaughan, D., 2015. Role of inhibitory autophosphorylation of calcium/calmodulin-dependent kinase II (αCAMKII) in persistent (>24 h) hippocampal LTP and in LTD facilitated by novel object-place learning and recognition in mice. Behav Brain Res. 285:79-88. Goode, N., Hughes, K., Woodgett, J.R., Parker, P.J., 1992. Differential regulation of glycogen synthase kinase-3 beta by protein kinase C isotypes. J Biol Chem. 267:16878-16882. Greely, H., Sahakian, B., Harris, J., Kessler, R.C., Gazzaniga, M., Campbell, P., Farah MJ., 2008. Towards responsible use of cognitive-enhancing drugs by the healthy. Nature. 456:702-705. Guo, W., Murthy, A.C., Zhang, L., Johnson, E.B., Schaller, E.G., Allan, A.M., Zhao, X., 2012. Inhibition of GSK3β improves hippocampus-dependent learning and rescues neurogenesis in a mouse model of fragile X syndrome. Hum Mol Genet. 21:681-691. Hampson, R.E., Rogers, G., Lynch, G., Deadwyler, S.A., 1998. Facilitative effects of the ampakine CX516 on short-term memory in rats: correlations with hippocampal neuronal activity. J Neurosci. 18: 2748-2763. Han, H., Dai, C., Dong, Z., 2015. Single fluoxetine treatment before but not after stress prevents stress-induced hippocampal long-term depression and spatial memory retrieval impairment in rats. Sci Rep. 5:12667. Hannesson, D.K., Howland, J.G., Phillips, A.G., 2004. Interaction between perirhinal and medial prefrontal cortex is required for temporal order but not recognition memory for objects in rats. J Neurosci. 24:4596-4604. Hartigan, J.A., Johnson, G.V., 1999. Transient increases in intracellular calcium result in prolonged site-selective increases in Tau phosphorylation through a glycogen synthase kinase 3beta-dependent pathway. J Biol Chem. 274:21395-21401. Hong, M., Chen, D.C., Klein, P.S., Lee, V.M., 1997. Lithium reduces tau phosphorylation by inhibition of glycogen synthase kinase-3. J Biol Chem. 272: 25326-25332. Hooper, C., Markevich, V., Plattner, F., Killick, R., Schofield, E., Engel, T., Hernandez, F., Anderton, B., Rosenblum, K., Bliss, T., Cooke, S.F., Avila, J., Lucas, J.J., Giese, K.P., Stephenson, J., Lovestone, S., 2007. Glycogen synthase kinase-3 inhibition is integral to long-term potentiation. Eur J Neurosci. 25:81-86. Hughes, K., Nikolakaki, E., Plyte, S.E., Totty, N.F., Woodgett, J.R., 1993. Modulation of the glycogen synthase kinase-3 family by tyrosine phosphorylation. EMBO J. 12:803-808. Jiang, L., Kosenko, A., Yu, C., Huang, L., Li, X., Hoshi, N., 2015. Activation of m1 muscarinic acetylcholine receptor induces surface transport of KCNQ channels through a CRMP-2-mediated pathway. J Cell Sci. 128:4235-4245. Jope, R.S., 2003. Lithium and GSK-3: one inhibitor, two inhibitory actions, multiple outcomes. Trends Pharmacol Sci. 24:441-443. Jope, R.S., Yuskaitis, C.J., Beurel, E., 2007. Glycogen synthase kinase-3 (GSK3): inflammation, diseases, and therapeutics. Neurochem Res. 32:577-595. Kim, L., Liu, J., Kimmel, A.R., 1999. The novel tyrosine kinase ZAK1 activates GSK3 to direct cell fate specification. Cell. 99:399-408. Kim, W-Y., Snider, W., 2011. Function of GSK-3 signaling in development of the nervous system. Frontiers in Molecular Neuroscience. 4:44. King, M.K., Pardo, M., Cheng, Y., Downey, K., Jope, R.S., Beurel, E., 2014. Glycogen synthase kinase-3 inhibitors: Rescuers of cognitive impairments. Pharmacol Ther. 141:1-12. Klein, P.S., Melton, D.A., 1996. A molecular mechanism for the effect of lithium on development. Proc Natl Acad Sci USA. 93:8455-8459. Kockeritz, L., Doble, B., Patel, S., Woodgett, J.R., 2006. Glycogen synthase kinase-3--an overview of an over-achieving protein kinase. Curr Drug Targets. 7:1377-1388. Lesort, M., Jope, R.S., Johnson, G.V., 1999. Insulin transiently increases tau phosphorylation: involvement of glycogen synthase kinase-3beta and Fyn tyrosine kinase. J Neurochem. 72:576-584. Lee, S.H., Liu, L., Wang, Y.T., Sheng, M., 2002. Clathrin adaptor AP2 and NSF interact with overlapping sites of GluR2 and play distinct roles in AMPA receptor trafficking and hippocampal LTD. Neuron. 36:661-674. Leeds, P.R., Yu, F., Wang, Z., Chiu, C.T., Zhang, Y., Leng, Y., Linares, G.R., Chuang, D.M., 2014. A new avenue for lithium: intervention in traumatic brain injury. ACS Chem Neurosci. 5: 422-433. Li, X., Rosborough, K.M., Friedman, A.B., Zhu, W., Roth, K.A., 2007. Regulation of mouse brain glycogen synthase kinase-3 by atypical antipsychotics. Int J Neuropsychopharmacol. 10:7-19. Li, X.H., Lv, B.L., Xie, J.Z., Liu, J., Zhou, X.W., Wang, J.Z., 2012. AGEs induce Alzheimer-like tau pathology and memory deficit via RAGE-mediated GSK-3 activation. Neurobiol Aging. 33:1400-1410. Li, X., Jope, R.S., 2010. Is glycogen synthase kinase-3 a central modulator in mood regulation? Neuropsychopharmacology. 35:2143-2154. Lipina, T.V., Roder, J.C., 2014. Disrupted-In-Schizophrenia-1 (DISC1) interactome and mental disorders: impact of mouse models. Neurosci Biobehav Rev. 45:271-294. Lovestone, S., Killick, R., Di Forti, M., Murray, R., 2007. Schizophrenia as a GSK-3 dysregulation disorder. Trends Neurosci. 30:142-149. Lyon, L., Saksida, L.M., Bussey, T.J., 2012. Spontaneous object recognition and its relevance to schizophrenia: a review of findings from pharmacological, genetic, lesion and developmental rodent models. Psychopharmacology (Berl) 220:647-672. Ma, T., Hoeffer, C.A., Capetillo-Zarate, E., Yu, F., Wong, H., Lin, M.T., Tampellini, D., Klann, E., Blitzer, R.D., Gouras, G,K., 2010. Dysregulation of the mTOR pathway mediates impairment of synaptic plasticity in a mouse model of Alzheimer's disease. PLoS One. 5:9. Mao, Y., Ge, X., Frank, C.L., Madison, J.M., Koehler, A.N., Doud, M.K., Tassa, C., Berry, E.M., Soda, T., Singh, K.K., Biechele, T., Petryshen, T.L., Moon, R.T., Haggarty, S.J., Tsai, L.H., 2009. Disrupted in schizophrenia 1 regulates neuronal progenitor proliferation via modulation of GSK3beta/beta-catenin signaling. Cell. 136, 1017–1031. Morice, E., Billard, J.M., Denis, C., Mathieu, F., Betancur, C., Epelbaum, J., Giros, B., Nosten-Bertrand, M., 2007. Parallel loss of hippocampal LTD and cognitive flexibility in a genetic model of hyperdopaminergia. Neuropsychopharmacology. 32:2108-2116. Murphy, B.L., Roth, R.H., Arnsten, A.F., 1997. Clozapine reverses the spatial working memory deficits induced by FG7142 in monkeys. Neuropsychopharmacology. 16:433-437. Nicholls, R.E., Alarcon, J.M., Malleret, G., Carroll, R.C., Grody, M., Vronskaya, S., Kandel, E.R., 2008. Transgenic mice lacking NMDAR-dependent LTD exhibit deficits in behavioral flexibility. Neuron. 58:104-117. Nocjar, C., Hammonds, M.D., Shim, S.S., 2007. Chronic lithium treatment magnifies learning in rats. Neuroscience. 150:774-788. Pan, X., Gong, N., Zhao, J., Yu, Z., Gu, F., Chen, J., Sun, X., Zhao, L., Yu, M., Xu, Z., Dong, W., Qin, Y., Fei, G., Zhong, C., Xu, T.L., 2010. Powerful beneficial effects of benfotiamine on cognitive impairment and beta-amyloid deposition in amyloid precursor protein/presenilin-1 transgenic mice. Brain. 133:1342-1351. Parton, A., Coulthard, E., Husain, M., 2005. Neuropharmacological modulation of cognitive deficits after brain damage. Curr Opin Neurol. 18:675-680. Passetti, F., Dalley, J.W., Robbins, T.W., 2003. Double dissociation of serotonergic and dopaminergic mechanisms on attentional performance using a rodent five-choice reaction time task. Psychopharmacology (Berl). 165:136-145. Passetti, F., Levita, L., Robbins, T.W., 2003. Sulpiride alleviates the attentional impairments of rats with medial prefrontal cortex lesions. Behav Brain Res. 138:59-69. Peineau, S., Taghibiglou, C., Bradley, C., Wong, T.P., Liu, L., Lu, J., Lo, E., Wu, D., Saule, E., Bouschet, T., Matthews, P., Isaac, J.T., Bortolotto, Z.A., Wang, Y.T., Collingridge, G.L., 2007. LTP inhibits LTD in the hippocampus via regulation of GSK3beta. Neuron. 53:703-717. Peineau, S., Bradley, C., Taghibiglou, C., Doherty, A., Bortolotto, Z.A., Wang, Y.T., Collingridge GL., 2008. The role of GSK-3 in synaptic plasticity. British Journal of Pharmacology 153: S428–S437. Pennington, B.F., Ozonoff, S., 1996. Executive functions and developmental psychopathology. J Child Psychol Psychiatry. 37:51-87. Perez, D.I., Palomo, V., Pérez, C., Gil, C., Dans, P.D., Luque, F.J., Conde, S., Martínez, A., 2011. Switching reversibility to irreversibility in glycogen synthase kinase 3 inhibitors: clues for specific design of new compounds. J Med Chem. 54:4042-4056. Perreault, M.L., O'Dowd, B.F., George, S.R., 2014. Dopamine D₁-D₂ receptor heteromer regulates signaling cascades involved in addiction: potential relevance to adolescent drug susceptibility. Dev Neurosci. 36:287-296. Phiel, C.J., Klein, P.S., 2001. Molecular targets of lithium action. Annu Rev Pharmacol Toxicol. 41:789-813. Polter, A.M., Li, X., 2011. Glycogen Synthase Kinase-3 is an Intermediate Modulator of Serotonin Neurotransmission. Front Mol Neurosci. 4:31. Portis, S., Giunta, B., Obregon, D., Tan, J., 2012. The role of glycogen synthase kinase-3 signaling in neurodevelopment and fragile X syndrome. Int J Physiol Pathophysiol Pharmacol. 4:140-148. Reisberg, B., Doody, R., Stöffler, A., Schmitt, F., Ferris, S., Möbius, H.J., Memantine Study Group, 2003. Memantine in moderate-to-severe Alzheimer's disease. N Engl J Med. 348:1333-1341. Rueda, N., Florez, J., Martinez-Cue, C., 2012. Mouse Models of Down Syndrome as a Tool to Unravel the Causes of Mental Disabilities. Neural Plasticity. 2012: 1-26. Rubinfeld, B., Albert, I., Porfiri, E., Fiol, C., Munemitsu, S., Polakis, P., 1996. Binding of GSK3beta to the APC-beta-catenin complex and regulation of complex assembly. Science. 272:1023-1026. Sahakian, B., Morein-Zamir, S., 2007. Professor's little helper. Nature. 450:1157-1159. Sannino, S., Russo, F., Torromino, G., Pendolino, V., Calabresi, P., De Leonibus, E., 2012. Role of the dorsal hippocampus in object memory load. Learn Mem. 19:211-218. Selemon, L.D., 2013. A role for synaptic plasticity in the adolescent development of executive function. Transl Psychiatry, 3: e238. D'Souza, Y., Elharram, A., Soon-Shiong, R., Andrew, R.D., Bennett, B.M., 2015. Characterization of Aldh2 (-/-) mice as an age-related model of cognitive impairment and Alzheimer's disease. Mol Brain. 8:27. Stambolic, V., Ruel, L., Woodgett, J.R., 1996. Lithium inhibits glycogen synthase kinase-3 activity and mimics wingless signalling in intact cells. Curr Biol. 6:1664-1668. Su, P., Li, S., Chen, S., Lipina, T.V., Wang, M., Lai, T.K., Lee, F.H., Zhang, H., Zhai, D., Ferguson, S.S., Nobrega, J.N., Wong, A.H., Roder, J.C., Fletcher, P.J., Liu, F., 2014. A dopamine D2 receptor-DISC1 protein complex may contribute to antipsychotic-like effects. Neuron. 84:1302-1316. Terry, A.V.Jr., Buccafusco, J.J., Bartoszyk, G.D., 2005. Selective serotonin 5-HT2A receptor antagonist EMD 281014 improves delayed matching performance in young and aged rhesus monkeys. Psychopharmacology (Berl). 179:725-732. Thotala, D.K., Hallahan, D.E., Yazlovitskaya, E.M., 2008. Inhibition of glycogen synthase kinase 3 beta attenuates neurocognitive dysfunction resulting from cranial irradiation. Cancer Res. 68:5859-5868. Thornton, T.M., Pedraza-Alva, G., Deng, B., Wood, C.D., Aronshtam, A., Clements, J.L., Sabio, G., Davis, R.J., Matthews, D.E., Doble, B., Rincon, M., 2008. Phosphorylation by p38 MAPK as an alternative pathway for GSK3beta inactivation. Science. 320:667-670. Tian, M., Zhu, D., Xie, W., Shi, J., 2012. Central angiotensin II-induced Alzheimer-like tau phosphorylation in normal rat brains. FEBS Lett. 586:3737-3745. Tietje, K.R., Anderson, D.J., Bitner, R.S., Blomme, E.A., Brackemeyer, P.J., Briggs, C.A., Browman, K.E., Bury, D., Curzon, P., Drescher, K.U., Frost, J.M., Fryer, R.M., Fox, G.B., Gronlien, J.H., Håkerud, M., Gubbins, E.J., Halm, S., Harris, R., Helfrich, R.J., Kohlhaas, K.L., Law, D., Malysz, J., Marsh, K.C., Martin, R.L., Meyer, M.D., Molesky, A.L., Nikkel, A.L., Otte, S., Pan, L., Puttfarcken, P.S., Radek, R.J., Robb, H.M., Spies, E., Thorin-Hagene, K., Waring, J.F., Ween, H., Xu, H., Gopalakrishnan, M., Bunnelle, W.H., 2008. Preclinical characterization of A-582941: a novel alpha7 neuronal nicotinic receptor agonist with broad spectrum cognition-enhancing properties. CNS Neurosci Ther. 14:65-82. Tsaltas, E., Kyriazi, T., Poulopoulou, C., Kontis, D., Maillis, A., 2007. Enhancing effects of lithium on memory are not by-products of learning or attentional deficits. Behav Brain Res. 180: 241-245. Turner, D.C., Clark, L., Dowson, J., Robbins, T.W., Sahakian, B.J., 2004a. Modafinil improves cognition and response inhibition in adult attention-deficit/hyperactivity disorder. Biol Psychiatry. 55:1031-1040. Turner, D.C., Clark, L., Pomarol-Clotet, E., McKenna, P., Robbins, T.W., Sahakian, B.J., 2004b. Modafinil improves cognition and attentional set shifting in patients with chronic schizophrenia. Neuropsychopharmacology. 29:1363-1373. Ueki, K., Yamamoto-Honda, R., Kaburagi, Y., Yamauchi, T., Tobe, K., Burgering, B.M., Coffer, P.J., Komuro, I., Akanuma, Y., Yazaki, Y., Kadowaki, T., 1998. Potential role of protein kinase B in insulin-induced glucose transport, glycogen synthesis, and protein synthesis. J Biol Chem. 273:5315-5322. Vreeker, A., van Bergen, A.H., Kahn, R.S., 2015. Cognitive enhancing agents in schizophrenia and bipolar disorder. Eur Neuropsychopharmacol. 25:969-1002. Watase, K., Gatchel, J.R., Sun, Y., Emamian, E., Atkinson, R., Richman, R., Mizusawa, H., Orr, H.T., Shaw, C., Zoghbi, H.Y., 2007. Lithium therapy improves neurological function and hippocampal dendritic arborization in a spinocerebellar ataxia type 1 mouse model. PLoS Med. 4:e182. Warburton, E.C., Koder, T., Cho, K., Massey, P.V., Duguid, G., Barker, G.R., Aggleton, J.P., Bashir, Z.I., Brown, M.W., 2003. Cholinergic neurotransmission is essential for perirhinal cortical plasticity and recognition memory. Neuron. 38:987-996. Woodgett, J.R., 1990. Molecular cloning and expression of glycogen synthase kinase-3/factor A. Embo J. 9: 2431-2438. Woodgett, J.R., 1994. Regulation and functions of the glycogen synthase kinase-3 subfamily. Semin Cancer Biol. 5: 269–75. Yu, S.Y., Wu, D.C., Liu, L., Ge, Y., Wang, Y.T., 2008. Role of AMPA receptortrafficking in NMDAreceptor-dependentsynaptic plasticity in the rat lateral amygdala. J Neurochem. 106:889-899. Yuskaitis, C.J., Mines, M.A., King, M.K., Sweatt, J.D., Miller, C.A., Jope, R.S., 2010. Lithium ameliorates altered glycogen synthase kinase-3 and behavior in a mouse model of fragile X syndrome. Biochem Pharmacol. 79:632-646. Zeng, H., Chattarji, S., Barbarosie, M., Rondi-Reig, L., Philpot, B.D., Miyakawa, T., Bear, M.F., Tonegawa, S., 2001. Forebrain-specific calcineurin knockout selectively impairs bidirectional synaptic plasticity and working/episodic-like memory. Cell. 107:617-629. Zhu, L.Q., Wang, S.H., Liu, D., Yin, Y.Y., Tian, Q., Wang, X.C., Wang, Q., Chen, J.G., Wang, J.Z., 2007. Activation of glycogen synthase kinase-3 inhibits long-term potentiation with synapse-associated impairments. J Neurosci. 27:12211-12220.